Autauga County is a county located in the central portion of the U.S. state of Alabama. As of the 2010 census the population was 54,571. Its county seat is Prattville. Autauga County is part of the Montgomery metropolitan area. Autauga County was established on November 21, 1818, by an act of the Alabama Territorial Legislature (one year before Alabama was admitted as a State). As established, the county included present-day Autauga County, as well as Elmore County and Chilton County. At the time, Autauga (aka, Tawasa) Indians lived here, primarily in a village named Atagi (meaning "pure water") situated on the banks of a creek by the same name (called "Pearl Water Creek" by settlers). Autaugas were members of the Alibamu tribe. They sent many warriors to resist Andrew Jackson's invasion in the Creek War. This county was part of the territory ceded by the Creeks in the Treaty of Fort Jackson in 1814. The first county seat was at Jackson's Mill, but the court only met there long enough to select a permanent seat at Washington, built on the former site of Atagi in the southeast corner of the county. In 1830, the county seat was moved to a more central location at Kingston and the town of Washington dwindled until it was completely deserted in the late 1830s. In 1866 and 1868, Elmore and Chilton counties respectively were split off from Autauga County, and the county seat was moved to the population center of Prattville, where a new courthouse was completed by local builder George L. Smith in 1870. In 1906, a new and larger courthouse was erected in a modified Richardsonian Romanesque style a block north of the older one. The building was designed by Bruce Architectural Co. of Birmingham and built by Dobson & Bynum of Montgomery. There were 20,221 households out of which 34.9% had children under the age of 18 living with them, 56.2% were married couples living together, 13.7% had a female householder with no husband present, and 25.5% were non-families. 22.0% of all households were made up of individuals, and 8.0% had someone living alone who was 65 years of age or older. The average household size was 2.68, and the average family size was 3.13. The sheriff of Autauga County is Joe Sedinger (R). The legislature is the county commission which consists of five members all of whom are elected from single member districts. The Autauga County School System is the county's public school system. East Memorial Christian Academy is located in an unincorporated area of the county, near Prattville. Samuel Smith Harris, (1841–1888), born in Autauga County, Presbyterian clergyman, founder and editor of Living Word magazine, and bishop of the Diocese of Michigan. William Henry Lanier, (1855-1929), born in Autauga County, was a prominent educator who served as president of Alcorn A. and M. from 1899 to 1905. He also served as superintendent of Yazoo City and Jackson, Mississippi black schools. Wilson Pickett, (1941-2006), born in Prattville, Alabama, American recording artist best known for singing In the Midnight Hour and Mustang Sally. ^ United States Department of Agriculture (USDA) Forest Service Ecoregions and Subregions of the United States, compiled and edited by W. Henry McNab and Robert G. Bailey, U. S. Government Printing Office, 1994. ^ a b "County Membership Reports". thearda.com. Archived from the original on 12 July 2011. Retrieved 2011-08-22. ^ "Autauga County - Alabama Sheriffs Association - Alabama". www.alabamasheriffs.com. Retrieved 2018-06-22. ^ "Home Archived 2013-08-21 at the Wayback Machine." East Memorial Christian Academy. Retrieved on August 3, 2013. "1320 Old Ridge Road Prattville, Alabama 36066"
^ "School History". Lanier High School. Jackson (MS) Public Schools. Retrieved 20 Oct 2017. Lanier was first organized as a junior-senior high school in 1925 providing instruction for pupils from the seventh through the twelfth grades. Wikimedia Commons has media related to Autauga County, Alabama. 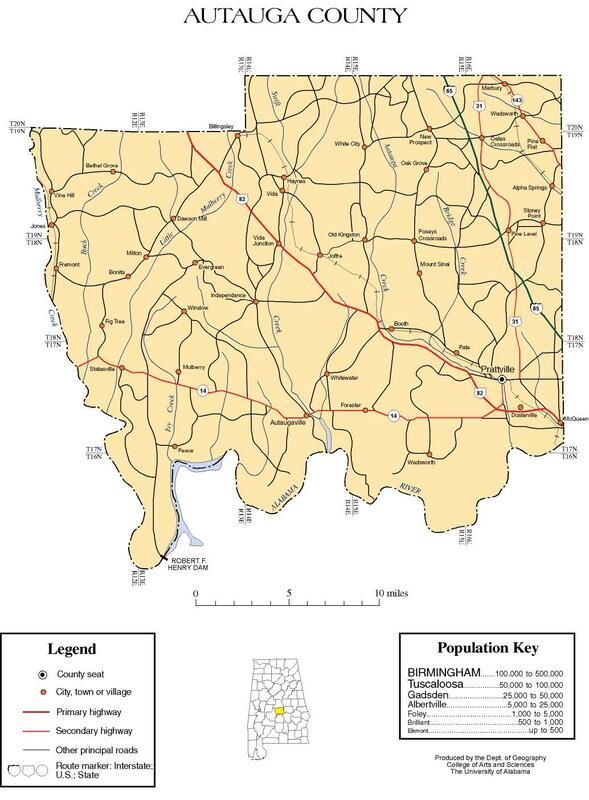 Autauga County map of roads/towns (map © 2007 Univ. of Alabama). This page was last edited on 23 March 2019, at 00:15 (UTC).